For millennia the world was seen as a creative, interconnected web of life — a web of life in which we participated deeply. But when the world came to be described as a lifeless, clock-like mechanism during the Scientific Revolution of the 16th and 17th centuries, life and intelligence came to be seen as existing only in human beings, and nature came to be increasingly seen as an object of exploitation that primarily exists to meet human needs. This also led to a profound sense of alienation, since human beings no longer had any real bond with the world. In Restoring the Soul of the World, David Fideler throws light on the unexamined connections between science, religion, and culture, and how our deepest worldviews have influenced the ways we relate to the world, other people, and our innermost selves. This book traces the ancient vision of living nature along its entire course: from its roots in the World Soul of the Greek philosophers, to its eclipse during the Scientific Revolution, to its return today. Drawing upon the most important scientific discoveries of recent times, Restoring the Soul of the World shows how the mechanistic worldview has broken down, and presents a new vision of living nature and our own intrinsic bond with the deepest structures of the cosmic pattern. 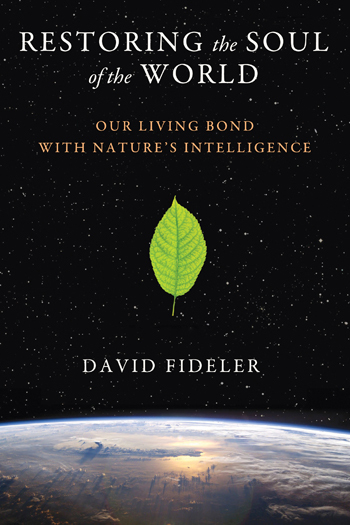 By learning from and collaborating with nature’s intelligence, we can bring the world to fruition, Fideler suggests, by viewing nature as a teacher and creative partner — and help to regenerate the Earth’s living systems. David Fideler studied ancient philosophies and religions at the University of Pennsylvania and holds a Ph.D. in philosophy and the history of science. He is the editor of The Pythagorean Sourcebook and Library, the journal Alexandria: Cosmology, Philosophy, Myth, and Culture and the Cosmopolis Project website.